Oftentimes, the day begins and ends with a shower. We jump in the shower in the morning to get an invigorating start to our day or relax in the shower in the evening to soothe our tired bodies and wash away the stressors of the day. There is a huge variety of showers, showerheads, and shower systems for you to choose from when renovating your home or adding a new bath, in a multitude of finishes, models, functions, and prices. of showers, showerheads and shower systems. 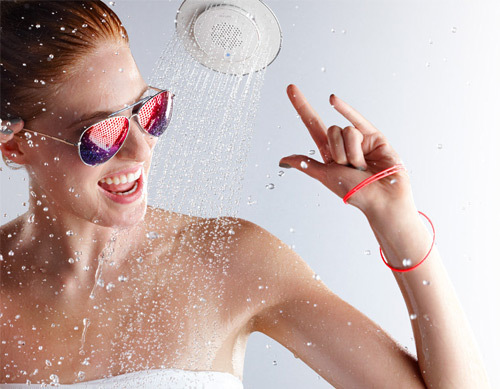 There are basically two types of showerheads - the fixed showerhead and the hand-held showerhead. A fixed showerhead is mounted as a permanent fixture to the shower unit's wall. The fixed showerhead is the most frequently installed type of showerhead. Fixed showerheads are usually constructed to allow for adjustment of height so that short or tall people can comfortably use the same shower. Fixed showers most commonly come in single handle, two handle and three-handle shower systems. Hand-held showerheads are connected to the shower unit's wall via a flexible hose or tubing to allow for freedom of motion when in use. Hand-held showerheads may be installed using a fixed and mounted bracket that is attached low on the wall. Hand-held showerheads are great for those with limited mobility due to accident, injury, illness, or handicap, or for easier bathing of children or furry four footed babies (pets). Hand held showers also make cleaning the tub, shower, and surrounding area a breeze. See all hand held showers. Those consumers who want to do their part to protect our fragile environment (and save money at the same time) should look for a low-flow showerhead. Low-flow showerheads use much less water than non-energy saving models. Although government standards mandate that showerheads can use no greater than 2 ½ gallons of water per minute with a standard 80psi pressure, low-flow showerheads use less water than the government guidelines call for. Use of a low-flow showerhead can allow you to save money by reducing your water bill and the amount of hot water that is used with each shower - cutting your electric or gas bill as well. Ever get the feeling that you can stand in the shower forever and still not rinse the shampoo from your hair properly? If your home has low water pressure, you will see a big difference by switching to a showerhead that is specifically designed for that common problem. One of the hottest trends right now is to install a shower system as opposed to a basic shower. A shower system usually consists of valves, showerheads, hand showers, body sprays, water outlets, and volume controls. A shower system can turn your time in the shower into a true spa experience. There are prepackaged shower systems or you can customize your own. The components of a shower system will vary in the number of valves that are used. These can be in either single handle to control water temperature and flow rate, or dual handled with water temperature controlled by one hand, and water flow rate controlled by the other. When a single valve is used, the best choice is a thermostatic temperature control valve, both for optimal performance and in consideration of the safety of the user. Your shower system will also have one or more water flow or volume control valves. This is a type of valve that turns water on or off; water flow is adjusted from the off position into increasing amounts of water flow. Your shower system can have an independent shower volume control for each outlet that is installed in the shower - such as one each for the showerhead, hand shower, and body sprays. Before installing a shower system, it is important that you take into consideration the basic parts of your existing plumbing system and make any required upgrades to make your shower system it's most functional. You will need to install enough shower outlets to fully accommodate the number of outlets that you install - shower heads, body sprays, and hand showers so as not to exceed the minimum flow rate of any one valve, which will lessen the performance of your shower system. Another concern is that you have the recommended pressure of at least 50psi for a shower system that has three outlets or more. And lastly, you should also have a dedicated 100 gallon hot water heater to ensure that your shower will have an adequate supply of hot water (although a 50 gallon hot water heater is sufficient for showers of eight minutes or less). If your plumbing system is connected to a water softener, this can restrict the hot water flow needed for your shower system to perform well - many homeowners simply install a water softener that is designed for such a high flow rate. The drain in your shower should also be large enough to dispel the volume of water that a shower system can put out. Optimally, your shower system should feature one 3” drain and two 2” drains.